How to use Google Analytics's in-page analytics to increase pageviews? 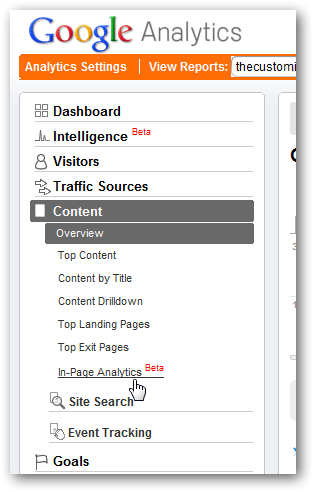 The Customize Windows > Wordpress and SEO > SEO tips > How to use Google Analytics’s in-page analytics to increase pageviews? How to use Google Analytics’s in-page analytics to increase pageviews? Almost all WordPress users (or other blog platform users) use Google Analytics. However, only few uses Google Analytics In-Page Analytics (which is currently in Beta). In this article, we will discuss on how to use in-page analytics to increase your pageviews of your blog. You must understand a basic Mantra of marketing. If supply is more than demand, then profit will not rise that much. Supply here stands for number of links in your navigation pane, sidebar etc. Profit, as you can understand is the pageviews. You can browse the page on real time to see the values in different pages. You have understand the data is representing for a certain time period. If you have added a new link (Apple in our example) it will obviously show low percentage. It is quite obvious, people are not interested to click Free e-books under Downloads category. As it is not on the top main Navigation, rather under drop-down, we can think to push the more clicked item towards up to facilitate the visitors to click more. If Home link showed less percentage, we might think to change the name to something else; it is quite obvious, people come from other pages and clicks the Home link to see “what is there”. If you have non functioning links (like Achievements, About us etc ) you can check how many percentage clicks them at all. If it is /they are high, and from analytics you can see the exit page in most cases are those pages: remove them. People clicks tags under posts, it was not expected by us, but turned to be true. You can try in our way to show post tags. We can not show that much failed unit and its remedy as the traffic of TheCustomizeWindows is on rise; as other’s Analytic unit can not be accessed, it will great if some of you send us a screenshot of your webpage form in-page Analytics; beside the free Advertisement of your website you will get an analysis too. This Article Has Been Shared 9620 Times! Articles Related to How to use Google Analytics’s in-page analytics to increase pageviews? SEO tips and Wordpress SEO plugins are indispensable tools for newbies as well as old users under different conditions. How much these SEO tips and Wordpress SEO plugins can actually change a website’s ranking? Title: How to use Google Analytics’s in-page analytics to increase pageviews? 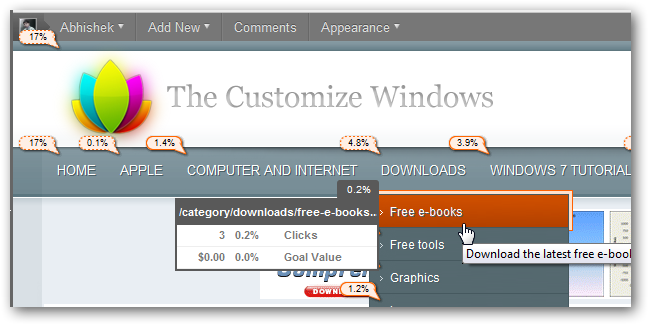 Cite this article as: Abhishek Ghosh, "How to use Google Analytics’s in-page analytics to increase pageviews?," in The Customize Windows, April 23, 2011, April 18, 2019, https://thecustomizewindows.com/2011/04/how-to-use-google-analyticss-in-page-analytics-to-increase-pageviews/.